The countdown continues as many people, both young and old, across the nation, anxiously await the premiere of the remake of Disney’s classic film Beauty and the Beast. The wondrous story of love that has transcended time will once again appear on movie screens starting on 17 March 2017. With its anticipated release, musicians and singers have been favoring YouTube as well as live audiences with their captivating renditions of the ever-popular theme song. True to her graceful and eloquent performance style, Jennifer Thomas has written and orchestrated a marvelous rendition of the popular trending theme song for Disney’s magical love story, Beauty and the Beast. For a tale that is as old as time, Jennifer has captured the wonder and amazement of the story of two people in love in this awe-inspiring performance. The magnificent cinematography by her husband, Will Thomas, of the majestic Royal Roads University Hatley Castle located in Victoria, British Columbia, Canada, proves to be the perfect backdrop. And the Paramount Theater in Seattle, Washington, serves as the beautiful interior of the castle. Jennifer would like to thank ARC Media for their excellent cinematography work inside the Paramount Theater. As Jennifer masterfully plays the beautiful antique Knabe grand piano, she is accompanied by the tranquil sounds of the cello performed by Armen Ksajikian who is highly acclaimed as “one of the GREATEST cellists in North-Central Eagle Rock!” Together their music creates a beautiful aura and as people listen they can imagine Belle and the Beast celebrating their love for one another as they enjoy a dance together across the ballroom floor. After the video, Jennifer shares a personal backstory of the making of the video and how it reminded her that beauty is not what is necessarily seen on the outside, but rather authentic beauty is found within an individual. 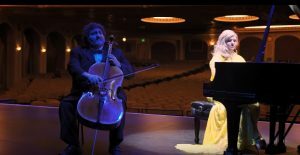 This is a must-see video as it helps set the perfect tone for those who will be attending theater showings of the classic tale that is Beauty and the Beast. Thank you for this article! Wow! This is an amazing piece of music! Beautiful, Jennifer & Armen Ksajikian. Will did a fabulous video and your performances were immpecible! Jennifer is an incredibly talented musician. Thank you for sharing your beautiful talent with all of us.